The PressureGuard® APM2 enables you to change instantly and easily from alternating pressure to basic lateral rotation with a single, recessed toggle switch. The silent, reliable, maintenance-free control unit allows simple adjustment for user comfort. With its two distinct therapy modes, the APM2 gives you twice the treatment options. Twice the flexibility. Twice the value. Change instantly and easily from alternating pressure to basic lateral rotation with a single, recessed toggle switch. Requires no disconnecting or exchanging of air lines. And, when ordered with the new Deluxe control unit, the APM2 offers even more value. Selectable audible alarm can be engaged to alert caregiver to low pressure status. 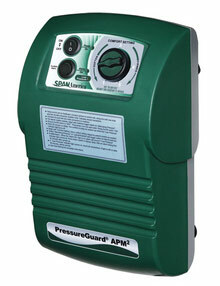 The "Low Pressure" indicator light gives users at-a-glance assurance of proper function. DESCRIPTION: The system consists of a foam shell with a high-density foam topper serving as the support surface underneath the patient. The foam shell also includes contoured foam bolsters at the sides and ends of the mattress, providing added patient stability and positioning. The system also includes the unique Heel Slope™ feature, designed to further reduce pressure for the sensitive heel area. Within the foam shell is housed the inflation system, consisting of air cylinders which run lengthwise within the mattress. The air Control Unit connects to the mattress at the patient foot-end. INDICATIONS FOR USE: PressureGuard® APM 2 models are powered, flotation therapy mattresses providing a pressure management surface for the prevention and treatment of pressure ulcers. The lateral rotation mode is indicated for use as a preventive tool against further complications associated with critically ill patients or immobility. MODES OF OPERATION: The PressureGuard® ® APM 2 provides options of alternating pressure or basic lateral rotation in 10-minute cycles. 1. Always unplug this unit immediately after using. 2. Do not operate near water. 3. Do not place or store product where it can fall or be pulled into a tub or sink. 5. Do not reach for a product that has fallen into water. Unplug immediately. 6. Use this unit only for its intended use as described in the operating instructions. 7. Never operate this product if it has a damaged cord or plug, if it is not working properly, if it has been dropped or damaged, or dropped into water. 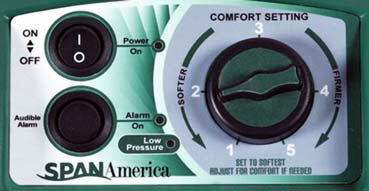 Contact Span-America Medical Systems, Inc., for return of Control Unit for examination and repair. 8. Keep the cord away from heated surfaces. 9. Never drop or insert any object into any opening or hose. 1. Use this unit only for its intended use as described in the operating instructions..
2 .Never operate this product if it has a damaged cord or plug, if it is not working properly, if it has been dropped or damaged, or dropped into water. Return the unit to Span-America Medical Systems, Inc. for examination and repair. 3. Keep the cord away from heated surfaces. Discontinue use if power cord is damaged or worn. 4. Never drop or insert any object into any opening or hose. Keep away from sharp objects. 5. Do not use outdoors..
6. Possible explosion hazard if used in the immediate proximity of flammable gases (risk of explosion). 7. Use only original spare parts and consumables. 9. Plug this product into a correctly grounded outlet only. 10. Before cleaning, unplug unit from its power source. Failure to do so could result in personal injury or equipment damage. 11. Do not use harsh cleansers, solvents, or detergents. Do not expose the unit to excessive moisture. Equipment damage could occur. 1. Place the PressureGuard mattress on the bed frame with the air line connectors at the foot end of the bed. Hospital-grade models have a gray vinyl side that should be down on the bed frame, and a green fabric side that should be face up toward the patient. In-home models have a light blue cloth side that should be face down on the bed frame, and a dark blue fabric that should be face up toward the patient. 3. Connect the ends of the air lines with two male connectors to the mattress. Ensure that the air lines are not kinked or twisted. Push in securely until you hear a “click”. 4. Ensure that the Toggle switch is in the “Alternating Pressure” position. 5. Ensure On/Off switch is “Off”. Plug power cord into wall outlet. Press On/Off switch “ON”. 6. Allow the mattress 20 minutes to inflate fully. The surface is ready for patient use when the “Low Pressure” indicator light turns off. 8. Place the mattress toggle switch in “Alternating Pressure” or “Lateral Rotation” mode as desired. When the “Alarm On” light is on, alarm will sound if “Low Pressure” indicator light comes on. Press Alarm switch to silence. Note: Will not alarm during first 45 minutes after plug-in. set-up, check all connections. If light is still on after 30 minutes, call for service. POWER LOSS: In case of loss of power, disconnect the air lines from the mattress BEFORE unplugging the Control Unit from the wall. This will seal the air in the mattress for days or weeks. See Note and Figure 1and Figure 2 below. 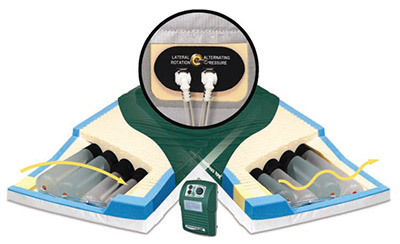 PATIENT TRANSPORT: In case of loss of power, or while transporting a patient on the mattress, disconnect the air lines from the mattress BEFORE unplugging the Control Unit from the wall. This will seal the air in the mattress for days or weeks. 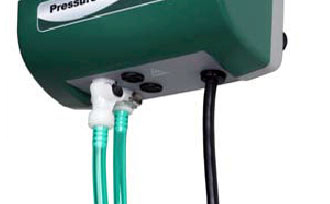 NOTE: If the air lines are green, you can keep them connected to the mattress, but disconnect them from the Control Unit (Figure 1) and insert them into each other as indicated in Figure 2 below. This will seal the air in the mattress for days or weeks. HEAD-OF-BED ELEVATION: Lifting the head of the bed more than 30º puts the skin over the sacrum at high risk for breakdown due to a concentration of weight on this area of the body in this position. We advise limiting raising the head of the bed to no more than 30º, and limiting the amount of time spent in that position. Patient repositioning to change pressures on the body remains a basic need in patient care. TROUBLESHOOTING PATIENT COMPLAINTS: Occasionally a patient will complain of feeling as if they are “sinking into a hole”. 1) Sometimes this happens when the head of the bed is elevated and the mattress is in either lateral rotation or alternating pressure. This sensation is a combination of the deflation of the cylinders during their cycle and the increased weight of the patient on the sacrum and pelvis when the head of the bed is elevated. This demonstrates the need to minimize elevation of the head of the bed. To improve this situation decrease elevation of the head of the bed. 2) Often patients complain when they are supine or side-lying and are not used to the changing pressures within the air system. Reassure the resident that this is normal functioning, as the cylinders alternately inflate and deflate. The “deflated” tubes are not fully deflated. Some air is always maintained in them to prevent bottoming out. After reassurance, patients get used to the changing pressures. BED LINENS: Seven-inch deep fitted sheets are recommended. Multiple layering of linens or underpads beneath the patient should be avoided for the prevention and treatment of pressure ulcers. For Safety Supreme version, it may be easier to use flat sheets, knitted stretchfit sheets, or deep-pocket fitted sheets. CAUTION: Be careful not to puncture the mattress with needles or sharp instruments. This may result in loss of integrity of the cover or internal air system. Regularly inspect the mattress cover for cuts, rips, cracks or tears. Do not use the mattress if the cover is damaged. BED RAILS: Due to concerns over the possibility of patient entrapment, Span-America recognizes that the use of rails of any length is a matter currently addressed by various regulations from local, national and international government agencies, and by individual facility protocol. It is the responsibility of the facility to be in compliance with these laws, which typically require that decisions on the use of bed rails of any type are based on assessment of the physical and mental status of each patient individually. If bedrails are needed by the patient to prevent fall-related injury, as determined by this assessment, we recommend that the bedrails be locked in the up position at all times. 1. Place a crashboard beneath the patient. 2. Select the “Alternating Pressure” mode. 3. Set the Comfort Setting knob to firmest setting. STORAGE: Always store the surface flat on a clean, level surface. Avoid storage of other equipment on top of the mattress. WARRANTY: All models are unconditionally guaranteed against failure due to manufacturing defects under normal use for 18 months. USE IN WOUND CARE: Use of PressureGuard® APM2 models is only one element of care in the prevention and treatment of pressure ulcers. Frequent repositioning, proper care, routine skin assessment, wound treatment and proper nutrition are but a few of the elements required in the prevention and treatment of pressure ulcers. As there are many factors that may influence the development of a pressure ulcer for each individual, the ultimate responsibility in the prevention and treatment of pressure ulcers is with the health care professional. AIR FILTER PREVENTIVE MAINTENANCE: The air filter for the Control Unit should be checked routinely for signs of dirt or contamination. The frequency for cleaning depends on the air quality. The air filter is accessible from the underside of the Control Unit - it is approximately two inches in diameter and covered by a clear plastic cover. As the filter is white, the need to clean is obvious. Simply remove the clear plastic cover, remove the filter, and hand wash using warm water and mild detergent. Rinse thoroughly and allow to air dry. Replace the filter and the clear plastic cover. For the mattress, only the cover requires cleaning and maintenance. Disassembly of the support surface for maintenance of internal components of the Control Unit or mattress is not recommended. Cover can be wiped clean with neutral suds and lukewarm water. Rinse and dry. For hard to clean spots, use standard liquid household/vinyl cleaners with a soft bristle brush. CAUTION: DO NOT USE HARSH CLEANERS OR SOLVENTS. For long-term incontinent applications, clean and disinfect cover daily. A scented cleaner/disinfectant is recommended. Iodophor type disinfectants (Betadine for example) will stain the fabric. For disinfection, phenolic or quaternary type disinfectants are recommended. Disinfectants should be hospital grade (tuberculocidal). Follow manufacturer’s instructions for use concentrations, contact times and rinsing. Contamination with blood on the fabric can be disinfected with a 1:10 dilution of household bleach (5.25% sodium hypochlorite) as recommended by the CDC. The use of bleach at improper dilutions may result in fabric discoloration and fluid pass-through. Where surveillance and epidemiology indicate ongoing transmission of C. difficile, an EPAregistered hypochlorite-based disinfectant is recommended. Follow the manufacturer’s instructions for use concentrations, contact times and rinsing. Generic sources of hypochlorite (e.g. household chlorine bleach) may also be used. Prepare the disinfection solution fresh daily at a 1:10 dilution. Improper dilutions may result in ineffectiveness and higher than recommended concentrations will damage the fabric. Note: alcohol-based disinfectants are not effective against C. difficile and should not be used to disinfect environmental services. For further information relative to this organism and infection control in the healthcare setting, please refer to www.cdc.gov/ncidod/hip. Disinfect mattress covers following contamination with bodily fluids and between patients. Inspect the covers and zipper area for signs of damage, puncture, or wear that could result in fluid pass-through. If the cover is stained, soiled, or torn, inspect the internal components for signs of contamination. Allow cover fabrics to air dry (approximately 20 – 30 minutes) before use. With its two distinct therapy modes, the PressureGuard® APM2 gives you twice the treatment options. Twice the flexibility. Twice the value. COVER: Bacteriostatic, flame resistant, fluid-proof, tear resistant. small scale and Cal TB# 117. ELECTRICAL: All control units 120 V, 60 H.
Medical equipment certified for Canada. MATTRESS HEIGHT: 7” for all models; Safety Supreme has 9” high side bolsters. WEIGHT LIMIT 350 lbs. for standard models. standard bed frame or box spring. WARRANTY: 18 months, not pro-rated, against manufacturing defects. FLAMMABILITY: All models comply with 2000 NFPA 101 (Life Safety Code), Cal. TB #129 and 16 CFR 1632 and 1633.